The Student Academy Leadership Team (SALT) comprise of eight Year 11 students. All of these students have been through a rigorous application process. 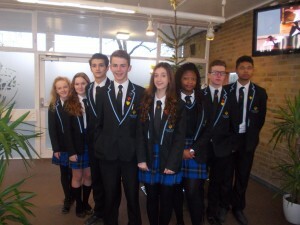 They have had to complete a letter of application and they have been through two interview processes to be appointed as members of the Student Academy Leadership Team. Their role within the Academy is integral to developing Student Leadership and Student Voice to drive Academy improvements and raise all students’ achievement. They oversee the Mark Hall Academy Student Parliament and feedback to the students each half term in Student Led Assemblies on initiatives and projects that are being run in the Academy. They also oversee the Year 11 Student Leadership Programme, which looks at different ways the Prefects and Senior Prefects can support the Academy. The SALT mirror and work alongside key members of staff on the Academy Leadership Team (ALT) and collaborate with this member of staff to work on specific areas with regards to their role. They regularly every Thursday morning to discuss and move forward different projects and ideas that have been initiated from Student Voice or Academy improvement plans. As the pioneers of the Student Academy Leadership Team, they will begin the process in the next half term of recruiting the next SALT to maintain the legacy they have started.